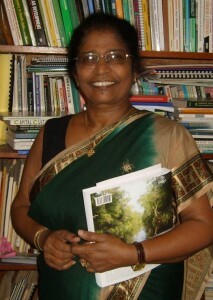 Professor Anoja Wickramasinghe is currently an Emeritus Professor at the University of Peradeniya, Sri Lanka, and an expert on social forestry and gender. She coordinates the National Network on Gender and Energy (NANEGE), and is a member of the Committee of Biomass Energy, through which she provides advocacy services to the energy sector. Her specific angle is currently covering the Millennium Development Goals (MDGs) from the perspectives of gender, natural resource management, and biomass development.